Legs, a body and eyes. Both ibb and obb lack other features. They need legs to run and jump around. A body so they can stand on top of each other. Eyes to give them a soul. 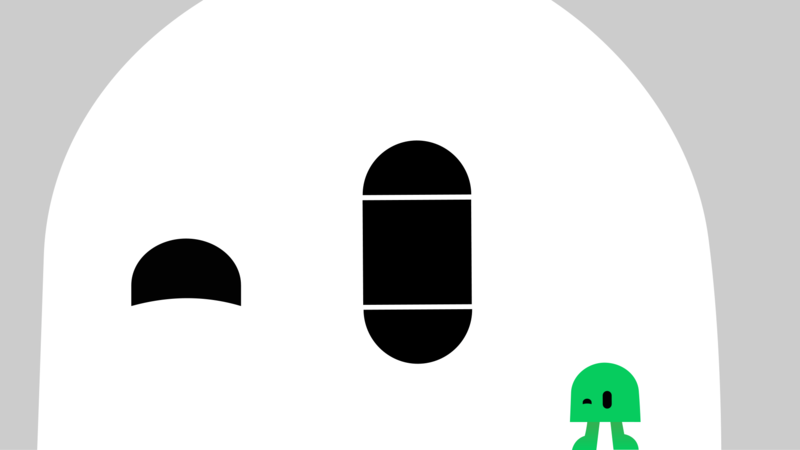 All characters in ibb & obb feature the same pill shaped eyes. They differ in size and position, but are all derived from the same system. Each individual eye is made out of separate textures: a rectangle, rounded caps and a shut version. The proportions of the rectangle is a variable, so an eye can range from circular to tall. 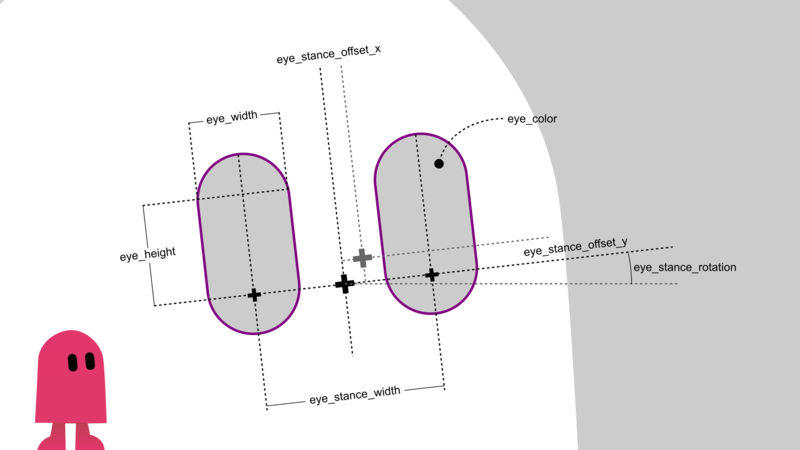 The space between the eyes and the position on the body are also parameters defined in ibb & obb’s long list of constants. Quite some constants are used for controling when ibb and obb should close their eyes and for how long. At the root of this there is the basic blink that helps moisten the ‘eyeballs’. Every 3 to 8 seconds the characters blink. A blink lasts for 0.1 seconds. There’s a 10 percent chance of a blink turning into a cute double blink with a 0.1 second pause in between the blinks. When players run over a certain speed, they won’t blink as they need full concentration. Close eyes for 0.3 seconds when jumping with the other player on top. No distraction during heavy lifting. Close your eyes when the other player lands on top of you or when you bump your head against something. When you make a header. Woooo. Launched in the air. Ouch! A hard landing, 0.3 seconds of pain. When the player decides to do nothing, it takes between 10 and 30 seconds for ibb and obb to get bored. They’ll sit down and a bit later, close their eyes for a nap until the player wakes them up again. And that’s how ibb and obb convey their emotions. No screams, no laughs, just blinks of different durations.